Build a website or maintain one. Learn how to code, draw and animate web graphics and add audio and visual elements, too. The best part? You can get a job without investing years of your life and lots of your money. 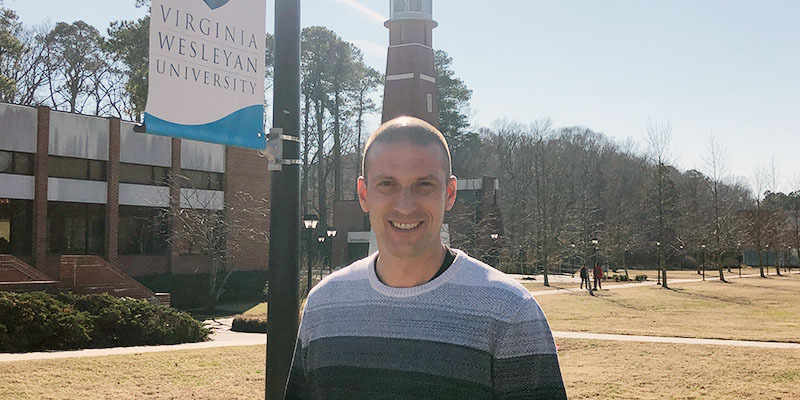 Michael Skipper earned his Career Studies Certificate in Web Development Specialist from Tidewater Community College and is now webmaster at Virginia Wesleyan University (VWU). Skipper thought his future was set for life when he accepted an apprenticeship as a millwright at the Norfolk Ford Plant shortly after graduating from Cox High School. When the plant closed in 2007, he turned his hobby of tinkering with computers into a career by beginning classes in TCC’s 24-credit web development specialist program. “Get your certifications!” Skipper advised. TCC offers all the resources, including practice tests, to ensure you pass the first time. Perhaps the best component of TCC’s web development certificate program is that students complete a real-world project in their final semester. Students in ITD 210 divide into groups and either build a website from scratch or update an existing site. At the end of the semester, the student groups present their work, and the client chooses which site closely matches his or her needs. Skipper touts the TCC professors as fantastic, and he enjoyed learning in the more personal environment on the Virginia Beach Campus, which made for regular interaction and hands-on classroom work. “The campus had a homey feeling, and that’s what I find here at Virginia Wesleyan,” he said. All credits stack toward TCC’s Associate of Applied Science in Information Systems Technology. More information: Contact Oliverio at joliverio@tcc.edu.